Been trying to find an answer to the exact length of what is considered "the now"? Got an answer for a monkey? I mean if we are supposed to live, and appreciate, the now... how long is a now... must be able to be experienced by the human brain... right? Like half a second or something? Or hundredth of a second? Last edited by Ghislain; 03-17-2015 at 02:30 AM. The Planck time is the length of time at which no smaller meaningful length can be validly measured due to the indeterminacy expressed in Werner Heisenberg's Uncertainty Principle. Theoretically, this is the shortest time measurement that is possible. Planck time is roughly 10−44 seconds. However, as of May 2010, the smallest time interval that was directly measured was 10−17 seconds. One Planck time is the time it would take a photon travelling at the speed of light to cross a distance equal to one Planck length. 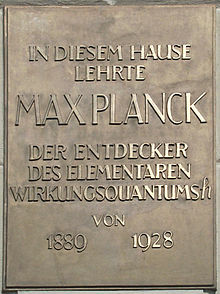 It is figured out from the Planck constant, which was first thought of by the physicist Max Planck in 1900. This work by Planck asserts that the energy of a photon is proportional to its frequency, and their relation can be put in terms of familiar units such as the joule by using the proportionality constant Planck gave us. Heisenberg's original quantum theory was improved by his teacher and colleague Max Born. Born put Heisenberg's equation into a matrix form. Born immediately noticed that to calculate using these matrices one matrix had to be multiplied by another matrix. In matrix multiplication multiplying matrix P by matrix X gives a different result from the one obtained by multiplying matrix X by matrix P. He further noticed that the difference between the two matrices involves h, the Planck proportionality constant. It shows that one can never pin down things like P (momentum) and X (location) exactly. It turns out that we cannot pin down a time any better than we can pin down a place or a momentum. We get closer and closer and then we reach the "Planck time." Edit: If it is any consolation I am as baffled by the mathematics as you are, but Planck's constant is used and works in mathematics...with my small brain I just have to accept it lol. Where do people like Planck come from? Last edited by Ghislain; 03-17-2015 at 02:57 AM. Last edited by Ghislain; 03-17-2015 at 03:53 AM. Dev, as you may know with your interest in film that the brain can only separate events that happen slower that 1/10th of a second, and thus if we show 10 frames of changing pictures in the time period of one second then we get the perception of motion...i.e. motion pictures; that is only a property of our brain giving us this illusion. Another example is the fluorescent tube; this gives off what we perceive as a constant light, when in fact it is flashing at the frequency of your power supply; 50Hz in the case of the UK. This causes headaches in the case of some office workers as they are unconsciously sensing this flashing light. We know that other animals see things differently and if they had the ability to talk to us when they see us watching a movie they may say, "why are you looking at that series of pictures". You can see the effect if you look at your television through the camera of your mobile phone, you get a flicker due to the frame rate, whereas if you look at a video on your computer the flicker is less, due to the difference in frame rate. But all of this is fairly irrelevant as it is just a property of the individual items; ourselves included. Is there actually an answer for a monkey? How far are we willing to go to find the answer to your "simple" question? A lot of what is talked about in the video is theory; do you see how much we don't know? Perhaps the universe as we know it is in the left ear of Schrödinger's cat, but like Heisenberg i'm not certain. Last edited by Ghislain; 03-17-2015 at 05:34 AM. well i think u are misunderstanding the concept of the now..
yeah, subjectively it varies. it helped me at a time to think of it is linear horizontal time - past -> present -> future... and then now time is vertical meaning it doesn't reflect on the past or project to the future but rather moves orthogonally (at 90 degrees, dimensionally) relative to horizontal time. aa very nice describsion.. ! !